The beginning of the 2010 World Cup is only 3 days away! The best 32 teams in the world will be aiming to win the FIFA World Cup Trophy as the tournament is held on African soil for the first time with South Africa being the hosts. 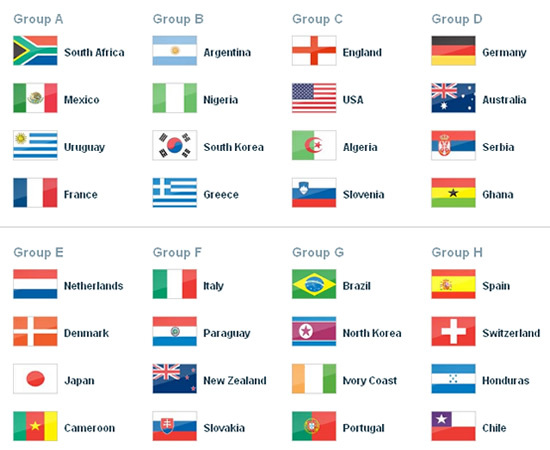 As a football fan there are a myriad of players and teams I’ve been keeping an eye on so as promised at the end of my post about Japan’s chances at the 2010 World Cup I decided to put my head on the chopping block and categorically state that one of the five teams below will win the World Cup this year! I don’t know a football fan who would disagree that the red hot Spaniards are head and shoulders above almost any other team in the world, so I thought I’d get everybody’s favorite out of the way first. They famously lost out to the United States in the Confederations Cup last year which to me can actually be a positive because that tournament was seen as a dress rehearsal for the World Cup and Spain’s players would have gained valuable experience playing on African soil. Seeing likes of David Villa, Xavi Hernades and Fernando Torres on any team sheet will send shivers down the spine of even the most experienced opposition. Firstly, let me state that I am an Argentina fan, the South American powerhouse hasn’t stepped out of it’s neighbour Brazil’s shadow in a while but there is this feeling inside that tells me that 2010 will be the year Argentina goes all they way. Lionel Messi is the best player in the world right now and is the diamond in one of the most potent attacking all-star lineups int he world right now – Tevez, Higuain, Aguero, Milito – they will score goals, whether they win the cup or not will depend on how many they can keep out. African football is on the rise, deciding on which African team would make my list was very difficult, factoring group opponents, experience and team strength I chose Ghana over the Ivory Coast as the African team most likely to win the World Cup, I am a big fan of Micheal Essien *cough* Chelsea *cough* and it’s sad that he wont be able to participate in South Africa, but I do believe that the Black Stars with their current team especially the juniors has what it take to take the heads of the few big names and raise a few eyebrows in South Africa – keep your eyes on them! The Three Lions have been known to flop at the World Cup no matter how star studded their team sheet looks, but out of all the teams I am mostly familiar with the English players as I watch almost all of them playing in the English Premier League. I know what they are capable of and individually there are some really excellent players on the England team like Frank Lampard, Wayne Rooney and Glen Johnson not to mention a world class coach in Fabio Capello. England’s success at the world cup will be depended on how well the players play together as nervousness on the big stage will be their biggest nemesis. I’m a massive Arjen Robben fan from his days at Chelsea but without a doubt the only countries that can rival the the glitter of the Dutch are the likes of Argentina, Spain and Brazil. Arjen is a injury concern but I am crossing my fingers that he will be fit to play. The Netherlands like Argentina are an attacking behemoth with Arsenal ace Robin Van Persie who looked fresh in the first and last quarter of an injury ravaged season and Wesley Sneijder who like Robben is a Real Madrid reject who has gone on to light up Europe this season winning all in his path, they now have a legitimate chance to win the World Cup. Germany is always a team who is there or there about in major tournaments, Italy won the last world cup when few expected them to and Brazil has won the World Cup more than any other country for a reason so anyone who discounts their ability to win the cup another time is quite frankly, retarded. Well enough of my unprofessional predictions laced with fanboyism, who do you think/expect/want/hope will win he 2010 FIFA World Cup in South Africa? deliberately waited for the first set of matches to be done before responding to comments, looks like a couple of your teams are in trouble but others doing wells o far. Spain is not going to win. Maybe it is England’s year but I hope the US beats them on Saturday. I think Argentina is going to be dangerous this year, and as much as I like Spain’s lineup, I think they’re going to have a hard time if they end up against Argentina. Brazil has a very strong squad, but they feel a bit more unbalanced, you never really know what’ll happen, while Netherlands and Germany both have solid teams. It’s really too hard to predict after #3, but I definitely think Argentina will be in the final. bredren u seem to be half heartedly going with what you know to be truths and what your heart wants to tell you. I’m hoping for some upsets myself and a few surprises. With the recent spate of injuries, the altitude in some places and other factors we may see a few indeed. After extensive reviews (i’ll send you my full one later) the last four will be ENG, ESP; BRZ, ARG. the order of the finishing…I’m about to finalise except to say they’re already paired in the 3rd/4th and finals. Argentina all the way. Spain a close second! Argentina is going to win this year. Now we can see that England and Spain do not have what it takes this year to win it all. "Jamie Carragher is the bookies&apos; favourite to be the first Liverpool player to foul Anfield old boy Fernando Torres" Go Carra! !